By now it was late afternoon, so we headed back Home to Disney’s Polynesian Village Resort to chill out for a bit and get ready for Mickey’s Very Merry Christmas Party (MVMCP)! This was going to be our first MVMVP ever, and we were looking forward to it. We had hoped to go to one in 2015, when I booked our holiday straddling Halloween and the start of Christmas, but we left a day early for the first party because they changed the dates slightly… I was so frustrated!!!!! 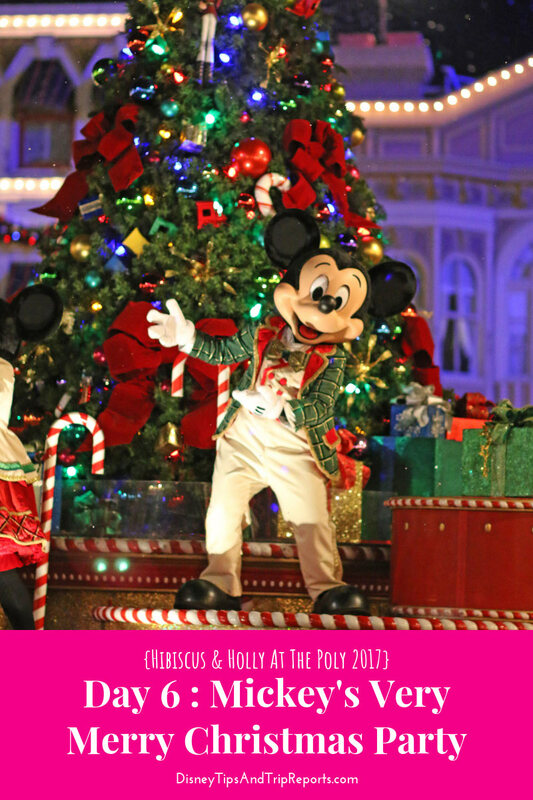 Mickey’s Very Merry Christmas Party is s a family friendly special event, separate from regular Magic Kingdom Park admission.It requires the purchase of a ticket for the party which runs on selected nights during November and December. The party officially starts at 7pm till midnight, but you can usually enter the park from 4pm. Theme park admission is not included in the price of the ticket, the ticket only covers your party entry. When you go through the turnstiles your ticket (or Magic Band) will be scanned and you will be given a special wrist band to wear. I wrote more about MVMCP on my blog here. Much like Mickey’s Not-So-Scary Halloween Party (MNSSHP), there are Disney Characters decked out in seasonal costumes to meet; a special seasonal parade, and fireworks; seasonal stage show in front of Cinderella Castle; party merchandise, and complimentary treats around the park, as well as special party foods to buy at locations around the park. Also much like MNSSHP, at Mickey’s Very Merry Christmas Party there is so much to do, you can’t possibly see and do it all! Lines for characters will run to a couple of hours easily. If you really want to see a character, get to the party as early as you can and start lining up to meet them. We did this at MNSSHP to meet Jack and Sally, and we still waited 2-3 hours! This may then have a knock on effect for other things like the parade (which does run twice at MVMCP) and the fireworks. My advice for either party is to have some sort of game plan – what are your priorities for the night? Like I said you can’t do it all! For us, it was to see the parade both times (because: photos for my trip report!) and to watch the fireworks. We also wanted to go around and try out the complimentary treats. We were not too fussed about meeting the characters – but would probably do that in the future. With all that out of the way, let me tell you about our experience at our first Mickey’s Very Merry Christmas Party! We got to Magic Kingdom around 6pm, and were given our party wristbands once scanned through the turnstile. You won’t get very far without these as they’re required to go on the rides, to meet the characters, or buy party merch. Enough of that rant… once in the park we were directed to the right, just past the Christmas Tree, and through a gate (that is usually closed) next to Tony’s Town Square Restaurant. There are some decorations up, and you are given you first free treat of the night – a wrapped cookie! Ours was a Santa Claus sugar cookie. You can see how big it is compared with the park map! This walkway eventually leads out near Cinderella Castle. Unlike MNSSHP where a lot of people dress up, not so many do so at the Christmas party. I wore a (long sleeve, because it was quite cold by now!) Christmas dress, and also brought a Christmas jumper to put on later in the evening. Instead of Mickey Ears, I wore my Minnie Earmuffs from Disneyland Paris. We wanted to make sure we watched the switch on of the Cinderella Castle lights – we were going to see this back in 2015, but got rained off – so we staked out a spot and waited. Elsa, Anna, and some of their friends light up the Castle, and this happens every evening during the he Holiday season, not just at Mickey’s Very Merry Christmas Party. It is absolutely gorgeous, and to see the Castle suddenly light up took my breath away and brought a tear to my eye! It continues to sparkle and twinkle during the night. We then took the walkway into Tomorrowland where we stopped by Cosmic Ray’s Starlight Cafe for our first gratis treat of the night – a Snickerdoodle Cookie and a cup of Hot Cocoa. Storybook Circus was next so that we could go into Big Top Souvenirs to buy some merch! I bought a few Disney Pins, some of those big fairy lights that you can hang around your neck, and a MVMCP ornament for our Christmas tree. And while in the vicinity, we stopped by Pete’s Silly Sideshow for a Peppermint Crunch Cookie and a bottle of Nesquik® Chocolate Milk. Carrying on around Fantasyland, we stopped near The Friar’s Nook to pick up the treat at that location which was a few pieces of Dove® Chocolate and a glass of Sparkling Apple Cider (not to be confused with the alcohol cider here in the UK, which is called hard cider in the US). The final free treat we picked up was the Giant Molasses Cookie & Eggnog at Liberty Square Ticket Office. We did miss going to Tortuga Tavern for a Snowman Soft Pretzel and Sno-Cone, and Auntie Gravity’s Galactic Goodies which was a Santa Claus Cookie and Sno-Cone. Quite likely because we were freezing and a Sno-Cone wasn’t going to hit the spot! We had already got the Santa Claus cookie on entry (it’s the same one) so we don’t feel like we missed out on too much!